Ladies and gentlemen, it's been a long week at work, so now it's time to let loose and have A Night Out - right in the comfort of home! Click here to play! Join stylish brunette Clarisse, the sultry redhead Tina and fun-loving blonde Betty as they go wild on a night out at the club. Drinking cocktails and downing beers is the order of the night, but don't worry if you start seeing double. In fact, get excited if you start seeing quintuple! When one of your party girls has doubles standing in the same line, it's time for a payday. Line up some cocktails for a similar result, but mix in a few beers to make for the wildest night of your life. Hit the dance floor and watch as the place goes crazy, turning loose change into big money. Keep the party charged by going to the bar, where flirting with the bartender could lead to a special surprise. You'll get to meet one of the lovely ladies, taking her for a dance and a drink. Who knows where the evening could take you when you go for A Night Out? Dance floor symbols cause a scatter, multiplying payouts. 3 symbols multiples by 5 times, 4 by 10 times and 5 symbols makes for a 50 times multiplier on wins for that spin. A mug of beer is the wild symbol, replacing anything other than a scatter or bonus symbol. Winning lines that contain a wild symbol are paid a bonus amount depending on how many wild symbols are in the line. 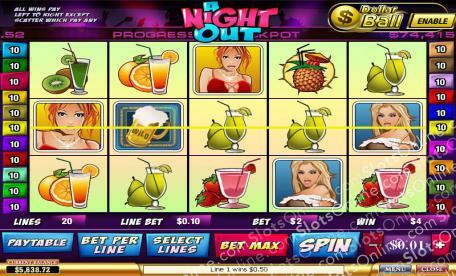 Choose a lady and get a surprise number of free spins. Then, choose a cocktail to determine the win multiplier for those free spins.